Join this hilarious family for another laugh-out-loud and refreshingly original season of Modern Family, winner of eleven Emmy Awards, including Outstanding Comedy Series two years in a row! As the extended Pritchett/Dunphy clan faces an uproariously unpredictable array of family vacations, holiday hassles, troublesome in-laws, and surprising secrets, they still somehow manage to thrive together as one big, loving family - even as they drive each other absolutely insane! One big (straight, gay, multi-cultural, traditional) happy family. 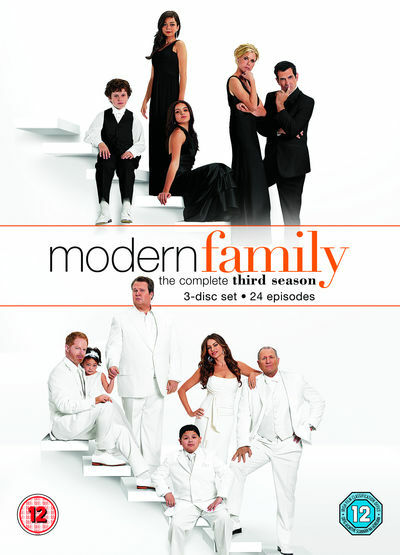 Smart, fresh and laugh out loud funny, Modern Family continues to break new ground as it delivers the chaotic and often hilarious lives and times of the combined Dunphy and Pritchett clans. Audiences the world over have fallen for this eclectic blended extended family and there's laughs aplenty as this box-set collects all four seasons of the Emmy® Award winning series.